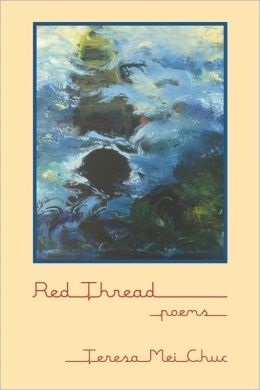 RED THREAD makes an exceptional contribution to the poetry of war. Consistently soft-spoken in tone and polemic-free, it is a shimmering and delicate book. While war undergirds much of the collection, Teresa Mei Chuc takes on other subjects as well: the clash and crash of immigration and class, the power of language, and family in its many dimensions (political, cultural, natural, and social). In fact no matter what her subject, she writes at the intersection of race, class and gender. Throughout, she maintains that same light brushwork, so self-contained and certain. Chuc's lithe lines of simple statements of fact revision a world too easily camouflaged in the violent maelstrom of our era. When the poet writes, "A bullet is made of/copper or lead," "A bamboo tree can weigh sixty pounds," "The best containers/for fire are made of metal" Chuc is setting the stage to memorialize both the scarring wounds as well as the pleasures of our lives. Such duality is one of the constants, the threads, running through this collection of remarkable delicacy. of children who beg with bowl in hands. The author's emblematic ability to contain dualities within the same moment is evident. In exploration of her subjects, rather than hold them in opposition Chuc describes them in a kind of balance or continuum. Beyond examining the city/soil polarity, Chuc explores (here and throughout the collection) a variety of cultural frictions and always comes up decidedly independent, insisting on making her own way. Here she underscores the power of words. In one sense, words confer upon her an identity. To wit, "Saigon" is persistently Saigon despite its official renaming almost 40 years ago as Ho Chi Minh City; "pho" remains "pho," insistently untranslated, though it could be described as a noodle soup. enters a body without consent. Tell myself it's okay, open, open. Only through the mastery of language can we know our world and ourselves. "Rough Draft" expresses this notion, even in the state of becoming: "I am a constant participial phrase. . . . I will never be a final draft. I will never be done." Chuc's facility with language is reflected in her ability to master the art of compression, even in her longer narrative works or those fevered pieces in which god-awful chemical bombs spill over civilians and casualty lists rise like welts. This is consistent in her war poems, astonishingly devoid of censure. Even the gritty "Song of Massacre," "A Priori," and "H'mong" resolve with a view toward life, survival, even flowers, albeit desiccated, in the war zone. It's not so much a sunny optimism one reads in Chuc's lines as much as a reflection of her own insistent triumphant life, the human spirit staring down the odds. But since war played a crucial role in her identity, war permeates the collection. One surprising aspect about her war poems is much of it targets not recent conflicts, though these are addressed, but the war in Vietnam. For a certain generation, the artistic response to that war always seems to come with a soundtrack by the Doors, its central players the bewildered and bartered American soldiers. Chuc offers a new perspective. This is timely. Scanning my teenager's high school curriculum reveals the offering of a history class dedicated entirely to the conflict and American involvement in Vietnam. Chuc's unique vantage point in part lends these poems their tensile strength. She was one of two thousand immigrants who escaped communist Vietnam by cramming into one boat. In "Immigration" she recreates the experience: "barely human and starving. We sleep on the floor and/wash ourselves with seawater. People are sick." Again mastering the conundrums of life, she recognizes how she herself nearly became the annihilator of her salvation and writes: "my constant crying made/[my mother] want to jump overboard." Chuc is the master of such duality, which she handles with the utmost subtlety. Few speak with her clarity and, at times harrowing, equanimity. Vietnam in Chuc's poems is, rather than the heat of battle, instead the starting point for the tale, which is one of the dislocated immigrant, transformed into a story of the American enterprise, and in the end is a story of becoming. Another of the collection's notable strengths is its locating and subsequent exuberant celebration of domesticity-the life of the home, intergenerational cooking, the sensuous pleasure of the rice bowl, a fanciful ode to the cashew, as well as a reveling in family relationships, particularly motherhood. She writes with a genuine heart of the tenderness of parenting and of her grandmother's embrace, in which she finds, "the assurance/of fruits." Indeed, a certain domesticity touches many of these poems, often with surprising effect as in the horrifying "Eternity in Gaza," where the image of the quaint domesticity washes the scene with a ghastly result. A child when she left Vietnam, the poet says she doesn't remember much but gathers family stories, scars and their ghosts: "Mother tells/of the ghost with a long tongue/that licks dishes at night." She celebrates her brother for his willingness to eat cockroaches rather than have their mother sell his baby sister, Chuc, for food; she is familiar with her immigration history, made so real it is written in the present tense: "It is October, when the winds of autumn blow strong in/ the Pacific." Chuc's genesis as a poet began in wonder, she recollects in "Bike Accident." She may have been slashed and bleeding by her tumble but her sense of wonder at having careened into a thorny rosebush ("eyelids scattered over me") with all its contradictions proves her transformative moment. As I turned the pages of RED THREAD, I realized this was the pearl in my hand.